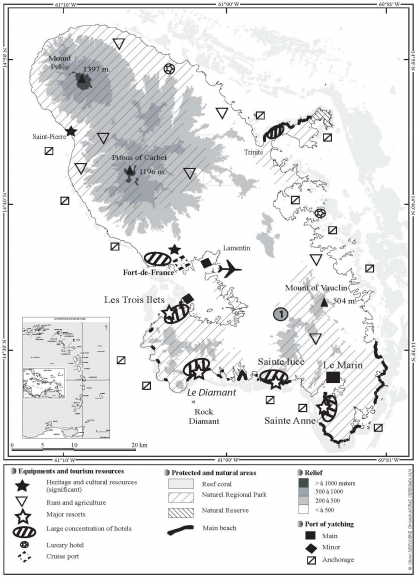 In this study, we propose to analyze the limits of mass tourism in the French Antilles, specifically the decline of tourism, economic limits, and ecological degradation). The recognition of these limits is overdue, and signals a need to define another model for tourism development. The popular coastal sector in the south of Martinique has been subject new regulations to protect marine resources. These regulations require the development of new practices and a greater level of awareness for tourists, for example, around coral reefs and mangroves. Ecotourism programs aim to demonstrate to visitors the forests rich natural resources and biodiversity in general. It also features the inclusion of small rural businesses that benefit from additional sources of revenue as a result of ecotourism. The situation in the French Antilles is complex: Urbanization is fraught with serious consequences for the coastline. Tourism products currently being marketed on the island are not competitive (particularly against the political dynamics of the neighbouring island of Dominica). Ecotourism and sustainable tourism are just beginning to develop in such destinations, where tourism has been declining in the last ten years. The situation of the French Antilles is paradoxical in a region that generally has a very favourable tourism. Assessing these limits through the scope of ecotourism helps to highlight the causes of these difficulties and to adapting to new tourism practices. Dans le cadre de cette étude, l’accent est mis sur les limites du tourisme de masse dans les Antilles françaises (dépréciation du tourisme, les contraintes économiques et les nuisances écologiques). La reconnaissance de ces limites est à l'origine de la prise de conscience tardive de la nécessité de définir un autre modèle de développement touristique. Dans le sud de la Martinique, le secteur le plus populaire du littoral, de nouvelles règlementations sont mises en place pour protéger les ressources marines. Cela nécessite le développement de nouvelles pratiques et de sensibilisation des touristes notamment autour des récifs coralliens et les mangroves. Les programmes autour de l'écotourisme visent également à montrer aux visiteurs la richesse des ressources forestières et de la biodiversité en général. Il comprend également les petites entreprises rurales qui reçoivent de nouveaux revenus grâce au tourisme. La situation est complexe dans les Antilles françaises: l'urbanisation est lourde de conséquences importantes sur la côte. Les produits touristiques commercialisés actuellement ne sont pas compétitifs (notamment contre la dynamique politique de l'île voisine de la Dominique). L'écotourisme et le tourisme durable commencent tout juste à se développer dans ces destinations où le tourisme classique est en difficulté depuis une dizaine d’années ; situation assez paradoxale au regard du dynamisme de ce secteur d’activité dans la région. En el contexto de este estudio, nos proponemos analizar los límites del turismo de masas en las Antillas Francesas (depreciación del turismo, las limitaciones económicas, ecológicas y las molestias). Este reconocimiento de esos límites está en el origen de la conciencia tardía de la necesidad de definir otro modelo de desarrollo turístico. En el sector costero de la más popular, como en el sur de Martinica, se pone en la normativa nuevo lugar para proteger los recursos marinos. Esto requiere el desarrollo de nuevas prácticas y la sensibilización de los turistas, por ejemplo, alrededor de los arrecifes de coral y los manglares. Programas en torno al ecoturismo también tienen como objetivo dar al visitante la riqueza de los recursos forestales y la biodiversidad en general. También incluye las pequeñas empresas rurales que reciben los nuevos ingresos a través del turismo. Pero la situación es compleja en las Antillas francesas: la urbanización está llena de importantes consecuencias para la costa. Productos turísticos que se comercializan actualmente no son competitivos (en particular, contra la dinámica política de la cercana isla de Dominica). Ecoturismo y desarrollo sostenible están empezando a desarrollar en este destino turístico, donde el turismo está en problemas en los últimos diez años. Esta situación es bastante paradójico en un turismo regional muy favorable. Sin lugar a dudas, pensando en el ecoturismo contribuye a identificar los destinos de estos retrasos y dificultades para adaptarse a nuevas prácticas de turismo. 1The island of Martinique, or Madinina (the “island of flowers”), is a classic coastal resort destination offering all of the necessary ingredients for a tropical destination: long beaches with coral reefs, exotic landscapes with banana and sugar cane plantations, and of course, dense perennial forest that flanks Mount Pelée. To this we can add a multicultural population, festivities and rum which contribute to the exotic nature of the region. However, all of these features listed above are readily available throughout all the Antilles. The Caribbean has experienced sustainable growth, benefiting from favourable set of circumstances (it is not a health risk area, it was spared from the latest natural disasters and it has not suffered a major terrorist incident). There are around 45 million international tourists who visit the Caribbean (Duval, 2004; Dehoorne, 2007), but the spread of tourism flows is unequal and regional competition is fierce, especially between the islands of the Greater Antilles. 1 Antilla, n°1014, 14th November 2002: 19. 2The recent history of tourism in Martinique is complex. After a period of constant growth, the sector has since the 1990s undergone a persistent deterioration in tourism flows. The risk of crisis is very real, but tourism remains a highly sensitive issue on the island. In November 2002, there was a general outcry at statements made by the Accord group on their reasons for leaving Martinique, which they described as “an appalling social climate”1. The advanced state of decay of abandoned hotel complexes was evidence of a long term strategy by a transnational group with more lucrative interests in the Greater Antilles. 3Beyon the legitimate aims that tourism seeks to achive and the more banal and realistic aftertaste unpleasant aftertastes, there are major contradictions and underlying tensions regarding tourism that exist in Martinique. In 1968, G. Cazes referred to the “Martinique tourism paradox” and questioned the “slow and difficult progress in its development”2. 4Martinique seems no longer able to compete with the other Caribbean islands. It seems necessary for this destination to diversify its tourist industry, but is unclear what form of tourism should be developed in order to distinguish the island form traditional Caribeean tourism. Martinique has many advantages and can therefore consider several options: health tourism, business tourism or ecotourism; the last of which we focus on here. 5In this study, we first propose an inventory of tourism in Martinique. Then we will present the state of tourism development, highlighting the limitations of the current development model. Knowing this context is essential to understand renewed interest in the ecotourism industry and the opportunities it represents for Martinique. 6First, it is necessary to acknowledge some limitations to the statistics examined. Although, it is easier to quantify incoming and outgoing migration for an insular territory, the main difficulty relates to the nature of the migration flows. The Martinquian population is much more mobile - the young people from the Antilles often university in the French metropole, and those who have emigrated return home for the summer holidays. We should not forget the return journeys made by French civil servants working on the island. Consequently, there are population categories who, to a certain extent, contribute to an over estimation of official tourism flows. Can a student who returns to his or her island of birth for the two month summer break be classified as a tourist? This phenomenon is noticeable at the Aimé Césaire airport in Martinique during July and August, when the intense activity is largely as a resulf of the resident population or people originating from the island. The statistics from maritime flows (cruise and pleasure boats) are more accurate. 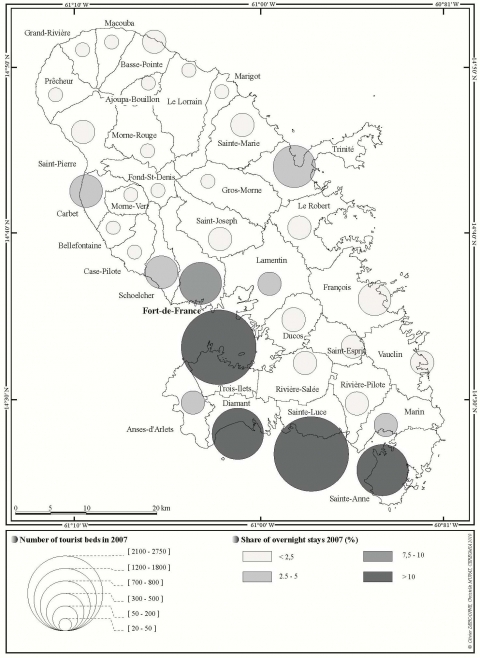 For the purposes of this paper, all data comes from the CMT (Martinique Tourism Authority) and from the former ARDTM (Agency for the Regional Development of Tourism in Martinique, which joined the departmental tourism office to become the CMT in 2003); despite the previously mentioned limitations, this data can provide consistent sets of statistics. 7Tourism has developed progressively since the beginning of the 1980s. The sector was aided by a rapid growth in the number of flights (Air France began a daily connection from Paris in the early 1970s), especially charter flights3, and the emergence of hotel complexes in the resorts on the south of the island (such as La Pointe-du-Bout in the town of Trois-Ilets). The number of visitors exceeded 300,000 in 1985 including short break tourists (55%), cruise ship tourists (approximately 42%) and pleasure boat tourists (less than 7%). There was constant growth until the middle of the 1990s (more than 750,000 visitors in 1991 and more than 950,000 in 1995). Short break tourism grew consistently until 1999, while the cruise tourism curve dipped in 1993 (the sector represented approximately 52% of visitors at this time). In 1998, Martinique recorded its highest number of visitors at 1,039,761, which provided tourism revenues of 315 million US dollars. 8At the end of the 1990s, tourism was the most important economic sector on the island, representing more than 10,000 jobs and employing more than 10% of the population. However, the rate of growth slowed down. Whereas other islands in the Antilles diversified their targeted clientele and started to position themselves in the nearby North American markets, the French islands ignored the potential of the regional market by basing their success on a French clientele. In the middle of the 1990s, intraregional competition began to increase, in response to Cuba’s increasing tourism prominence. Far from realizing the crisis that would hit the French West Indies, the views at the time remained optimistic: The islands would be in a position to withstand strong competition from the Caribbean marketplace. 9The number of visitors to Martinique has continued to fall since 1998. The overall activity of the airport has provided clear evidence (1,518,400 passengers in 2004 compared to 1,665,963 in 1999). Moreover, the cruise ship sector has been hit hardest by the crisis: Fewer than 100,000 cruise ship passengers (from 151 ships) stopped at the island in 2005. Gone is the time when Martinique received over 500 cruise ships (even 678 in 1991). The share of tourism revenue from pleasure boat tourism remains insignificant, representing only 3.5% of all visitors (Dehoorne, 2007). 10The change in the tourists’ geographic origins illustrates the recession affecting the sector. In 1987, most visitors came from France and Europe (58.8% and 6.3% respectively), then North America (22.7%) and the Caribbean (11.2%). Tourism growth in the 1990s was due to French visitors (70.8% in 1990), then European visitors (5.1%) while the presence of North Americans diminished (12.5%). The share of North American tourists was only 3.8% in 1998 (compared to 80.1% for French people). Of the 3 million recorded tourist stayovers in 2005, only 0.8% originated from the United States, while Canadians made up 1.1% and Europeans 3.1%. The French dominate the sector with 87.5%, followed by Caribbean nationals with 7% (largely those living on neighbouring islands). The number of ‘French tourists’ originally from the Antilles (or emigrants on holiday) is significant (more than 40% of all tourist stayovers on the island), yet they prefer to stay with family and friends. 11The decline in North American clientele, the financial impact of which was hidden due to the growth in the French market, heralded the redirection of tourism away from the French West Indies. These islands are no longer considered primary tourist destinations in the regional market. They have changed from offering up market tourism to offering mass tourism for one market, the French. 4 Hot rainy season, July to November. 5 Dry season, December to June. 12The tourism wealth of the island is based on the classic threefold model of sun, sea and sand (Sheller 2003). The potential for tourism is significant, with 350 km of coastline surrounding Martinique. Long beaches of white sand stretch out to the south, while coves and bays of differing size can be founds along the eastern coast as far as the Caravelle Peninsula. Beaches of black sand are more prevalent over the length of the northern coast. The unequal distribution of more popular resources explains why tourism flows are disproportionately concentrated along the southern coastline and a number of Atlantic coastal sectors (See Figure 1). The mildness of the tropical maritime climate (averaging 26°C annually) governed by the gentle rhythm of the ‘winter’4 and ‘summer’5 seasons, along with the volcanic and mountainous areas (which cover 60 % of the territory) and the diversity of the soil, has contributed to the biological wealth of the area and the particularities of its landscapes6. High altitude rainforests (with over 200 plant species) cover the northern slopes while the southern area contains arid zones, savannah, petrified forests and strips of mangrove forest along the coast (1,850 hectares). 13The wildlife potential is just as promising. The island contains more than 1,700 species of flower, including the multicoloured bougainvillea, hibiscus, orchid and wild anthurium. The diversity of the forest milieus (covering 43% of the island’s surface) and natural milieus is ideal for avifauna (over 235 species listed, permanent or migratory). Martinique possesses two natural reserves (the Caravelle peninsula on the eastern coast and the Sainte-Anne islets at the south eastern extremity of the island) and listed sites (such as the Montagne Pelée volcano). In terms of culture and heritage, many other resources (especially involving rum, Creole culture, etc.) are present on the island. 14The tourism potential are great, but the development of tourism sites has remained inadequate. The existence of these resources has not been accompanied by a rational and coherent enhancement policy to meet the needs of tourism. For example, most tourists visit the site of Montagne Pelée in less than thirty minutes (when the only onsite café is open) before continuing their ‘tour of the island’. This rudimentary development of tourist sites is harmful to Martinique’s image, and the lack of adequate improvement projects has caused a gradual deterioration in the quality of sites without any prospects of economic growth. 15The more mountainous areas on the northern coast of the island (which face rural depopulation) have relatively little tourist activity. Only 2% of the Martiniquian territory has a high number of visitors and 10% has a significant number. The hotel sector particularly illustrates this point. The island currently has 12,200 beds available, about three-fifths of which are concentrated in four southern boroughs (Trois-îlets, Sainte-Anne, Sainte-Luce and Diamant; See Figures 1). Of course, at the centre of each of these towns the hotels are grouped together in specific micro territories. Gites (268 accommodation units with 904 beds) and guest houses (948 beds) complete the range of commercial accommodations available, and they follow the same spatial pattern. Of a total of 7.5 million recorded tourist stayovers, three quarters were spent along the southern rim of the island, in the Fort-de-France bay area and in some parts of the southern Atlantic coast. 16The extreme concentration of tourism practices in the south along with inadequate facilities (insufficient or nonexistent parking, substandard sanitation) has resulted in a loss of appeal. The concentration of flows in the south has caused problems: The main roads are congested during weekends and school holidays, and 4x4s regularly drive across ‘protected’ coastal vegetation zones to circumvent the traffic. The site of the Salines beach (the most renowned beach on the island at Sainte-Anne) attracts more than two million people per year. Resort activities have now spread to local communities, which have opted to camp in the forests next to the beaches. Each new local recreational pursuit becomes an additional activity within international tourism, itself contributing the equivalent of 21,000 extra people per day. These new realities explain why tourists sometimes feel that the beaches have become overly crowded and too noisy. The quality of sites has deteriorated and there has been no significant benefit to the economy. Property speculation at the more sought after coastal areas is widespread (100km²), and illegal dwellings are being constructed on protected zones and on publicly owned tracts of coastal land. 17On the less popular destinations along the north western coast of the island, several hotel complexes from the 1980s have closed. As a result, the receiving capacity of the hotel sector has decreased (4,700 rooms in 109 establishments in 2005 compared to 8,733 rooms in 117 establishments in 1998), further polarizing spatial imbalances in the tourism industry on the island. 18To some degree, the pull of mass tourism toward the southern coastline reflects the ability of traditional tourism resources (white sand beaches and lagoons) to attract people. However, the shortage of facilities and the consequent gradual deterioration of overvisited sites have created concerns about economic recovery and the sustainability of tourism on the island. 19With the decline of tourism numbers in recent years and increasingly fierce competition between other tourism resort islands, it is necessary for Martinique to diversify its tourism industry. Thus, it is necessary for this destination to develop tourism niches to attract new clientele and revitalize this endangered sector. Given the small area of the territory, conflicts of use and diverse interests, as well as increasing global concern for environmental conservation, Martinique must engage in sustainable tourism development. It is thus crucial to introduce the concept of sustainability in all future discussions of tourism development. 20Thus, ecotourism is presented as the appropriate tool for the linkage tourism and the environment. More than just a passing trend, ecotourism is emerging as a promising industry for Martinique. 21Ecotourism is emerging as a multifaceted concept that defies any one definition. It can be used as an alternative approach to development that facilitates the preservation of protected natural areas, it can be used in against poverty reduction, and it can also be an instrument for sustainable development at the centre of new governance models (World Tourism Organisation 2003 and 1992). It also offers a new conceptual framework to implement development procedures based on a better organised tourism sector (Blamey, 2001). Ecotourism, as a form of tourism with a lower impact on local areas, includes the concepts of nature tourism, cultural tourism, and outdoor scientific or sporting activities. 22In contrast to mass tourism, ecotourism is associated with activities that have a limited impact on the physical and cultural environment (Lequin 2001, 2002). It therefore represents a form of tourism that has a marginal impact on host areas and societies. Revenue derived from ecotourism helps finance the protection of the local environment and culture, while tourist activities with small groups of visitors demand very little of the natural resources. Particular attention is paid to the nature of these visitors’ consumption and to the need to recycle, while discussions on water resources, energy and waste are essential. Ecotourism thus goes beyond the simple preoccupation of environmental preservation include the human dimension, placing an emphasis on respect and understanding of host societies, and identifying tourists as participants in the development programmes. (See Table 2). Preservation of the environment and regard for the cultural dimension. Financial support in the protection of the above, with a limited impact from activities. Improvements in living conditions, and diversification of economic activities. New revenue, improvements in infrastructure. Informed clientele, respectful towards communities and the visited sites, sensitive to different cultures. Educated about the environment. Given responsibility and opportunity to participate in decision-making processes, ownership of the activity (entertainment, goods and services). Move towards local governance. Control of the volume of tourism consumption, development of the receiving societies and conservation of resources. A tourist experience that includes the opportunity for people to come together and that contributes to a more equal and collaborative development process. 23A sense of responsibility, participation, local governance and sustainability are some of the necessary elements linking the ecotourism experience to models of ethical tourism, fair tourism and solidarity tourism. The above relatively conceptual terms, defined by charter, attempt to explain an alternative view of travel and tourism, this is more sensitive to the needs of host societies. “Ecotourism offers a different type of holiday; it embodies new trends of thinking on tourism development and on the tourism experience that sit well with the principles of sustainable tourism, i.e. a form of tourism that is respectful towards the environment, and in a wider sense, that represents resource protection, respect for cultural identities and responsible stakeholders” (Lequin, 2002). 24Ecotourism advertising, along with its claims and the abundance of labels, has appeared under various guises in the move from theory to practice, with the aim of capturing a very profitable segment of the tourism market. Wealthy niche groups who are in search of unique experiences (WTO 2003). These new opportunities explain the ambiguity surrounding ecotourism in commercial practices where the manifold increase in the sometimes incoherent marketing schemes has been accompanied by many types of ‘self-labelling’. 25Before developing a specific strategy, it is important to know the natural areas and activities from which ecotourism is to develop. Martinique has a diversified and important earthly and submarine ecosystem that can be interpreted through its biological wealth (Augier, 2005, 2007). 26Terrestrial ecotourism is a form of tourism that develops based on natural and cultural inland resources, such as forests. Coastal formations are found in coastal mangrove and rear mangrove formations, "mancenillier" and "raisinier" sandy beaches and volcanic coasts. Xerophilious forests are present in the south: Mount Vauclin, Morne Aca, and the heights of Trois-Ilets. Mesophilic forest is observable at Morne Monesie, Saint-Esprit, and Anse Couleuvre. 28In addition to the landscape diversity, Martinique is one of the richest islands in terms of indigenous tree flora. According to JP FIARD (1992), Martinique contains roughly 80% of all indigenous species located the Lesser Antilles. He found that there are 380 species of rare trees in Martinique, compared to 1016 in Guyana with 90,000 km2, and this data can be used to confirm the abundant flora of the island. The first also has several relics of vegetation among the best preserved of the Lesser Antilles, especially in the tropical upper floor. 29The rich flora and fauna of Martinique is regulated by a significant number of protection policies. They include regulations in urban planning, forestry legislation or hunting and fishing, nature protection. 30Also, it is relevant note that more than half the island is covered by a Regional Natural Park, reflecting a desire to protect and conserve the natural environment. These protections combined with the existence of the park, guarantee the environmental quality of the Martiniquan, an indispensable resource for developing ecotourism. 31The majority of these areas are already being exploited for tourism. Many local companies offer products ranging from the simple discovery of natural and cultural Martiniquan heritage to leisure activities (mangrove or sea kayaking, hiking, canyoning, museums). These activities also provide the opportunity to discover the natural environment and acquire knowledge about these environments (fauna, flora, reproduction, role of each species, etc.) (See figure 2). 32Marine ecotourism is a form of ecotourism that takes place in coastal and marine settings. The coast generally starts at the point of land where the high tide reaches a point of land, and it runs to the edge of the continental shelf under the water. Marine settings include oceans and large inland lakes. Specific coastal and marine settings are diverse, ranging from estuaries, to beaches and to ice shelves; in short, marine ecotourism includes any location which is accessible to tourists. Mangroves: The extent of mangroves can be estimated at over 40 km, of which almost half (17 km) is located in the Bay of Fort-de-France. The rest is shared between the Cul-de-Sac du Marin and the haven of Robert (about 4.5 km each), Sainte-Luce (2.5 km), small bays of the South Atlantic (total of approximately 10 km) and the Caravelle (2.1 km). They cover about 2 100 hectares according to the inventory of wetlands in 2005. Marine herbariums: The grasses that covers at least 40km² are shared between the Bay of Fort-de-France, and the other bays and shoals of the South Island and are protected by barrier reefs from 10 to 20 meters deep. Reef formations: The reef system of Martinique extends over a length of 70 km. It covers about 200km² along the southern Atlantic and southern coasts, at a depth of 0 to 30 meters. These reefs are particularly well developed along the Atlantic coast, where they face the heavy swell. 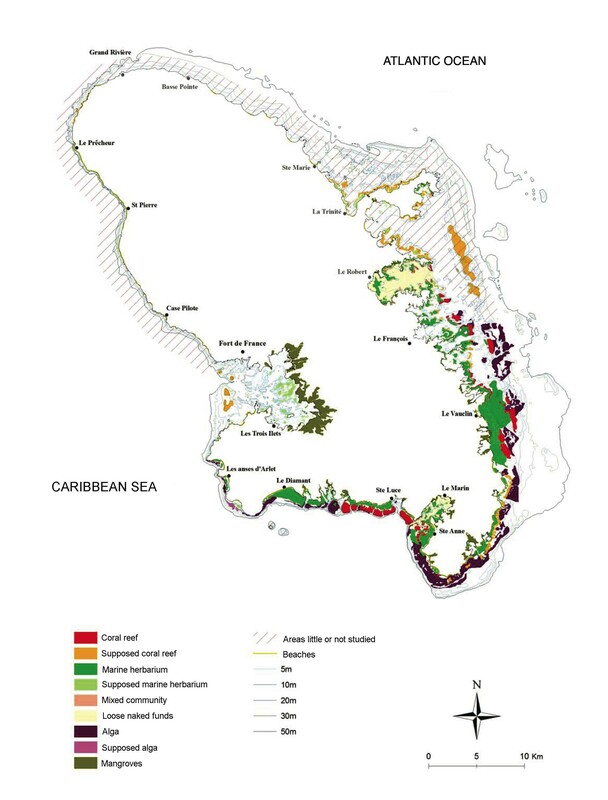 From Vauclin to La Caravelle, the low depth of the continental shelf and successive variations in sea levels has enabled the construction of a double barrier reef 2 to 5km from the coast. A wide reef has developed along the southern coast from the tip of Sainte-Anne at Morne Larcher. 34In the sheltered bay of Fort-de-France, Robert and Cul-de-Sac du Marin and the leeward side, a rich coral reef contained many small reef branche and coral blocks. Today they are largely necrotic and subject to problems. The Caribbean coast has a particularly narrow island shelf with rocky slopes. The absence of a continental shelf and the successive eruptions of Mount Pelée slowed the development of the reef. It has nevertheless possesses reef colonies which were established on bedrock. 35The combination of these three ecosystems is necessary for the fragile ecological balance of Martinique and for its biodiversity. Indeed, these environments are home to a remarkable biodiversity, as some species only living in the Caribbean. These include 370 mollusc species (Lamy et al., 1984), 143 fish species (Bouchon-Navarro et al., 1997) and 5 species of turtle. Even so, today none of these ecosystems benefit from protection tools, with the exception of sanctuaries (See figure 2). Coastal and marine areas have been a leading mainstream tourism destination for several decades. The popularity of coasts, not only a place to visit, but also to work and live has placed a great deal of pressure on natural resources found there. The collapse of fishery stocks, decline of coral reef health and the degradation of coastal habitats has positioned coastal regions on the brink of destruction. Marine related tourism activities continue to add pressure to coastal and marine areas. However, if done in a responsible manner, according to the principles of ecotourism, negative impacts can be mitigated and positive outcomes can be realized, both for coastal communities and natural resources. 36There are many different kinds of touristic activities take place in coastal settings. One of the most appreciated marine ecotourism attractions is wildlife watching, especially turtle watching. 37Among the seven turtle species that can be found globally, five of them can only be found in the water and on the beaches of the French West Indies. Three are nesting and feeding in Martinique: the Hawksbill (Eretmochelys imbricata), the Green Turtle (Chelonia mydas) and the Leatherback (Dermochelys coriacea). Two only feed in the coasts surrounding Martinique: the Loggerhead (Caretta caretta) and the Olive Ridley (Lepidochelys olivacea). 38Today, all turtle species are strictly protected in Martinique by the decree of October 14th, 2005, which identified the lists which are the protected turtles on the national territory and modalities of their protection. This decree also details that turtles and their eggs are completely protected by the law. Beside the protection of individual turtles, it adds the protection of nesting, hatching, and feeding grounds. Finally, it allows for the trade of scales that came from aimals killed before 1993. 39In Martinique, there is a restoration plan for the protection of turtles this is shared with Guadeloupe because the French West Indies have nearly identical problems for turtle protection. 40This plan has been validated by the Conseil National de la Protection de la Nature (CNPN) for five years (from 2007 to 2012) and has been realized by the Turtles Network of Martinique. The network is run by the Direction Régionale de l'Environnement (DIREN), the contracting authority of the restoration plan for turtles. Coordination and implementation have been entrusted to the Office National de la Chasse et de la Faune Sauvage (ONCFS), a public institution. The SEPANMAR and other associations carry out monitored field activities, issues communications regarding turtles, and participate in the action plan. The diving clubs of the island do counts of turtles a site. Communication and awareness (general public, schools...). 42In this plan, a small space is devoted to the protection and development of turtles as an asset for ecotourism. The plan recognizes the potential importance of turtles for the tourism industry. It advocates meetings with stakeholders that may benefit from these developments (diving clubs, hotels, tour operators, tourism offices, etc...) and agencies involved in tourism (CMT, Regional Tourism...). It also makes concrete proposals for action, such as the establishment of a common image bank, lectures on turtles for tourist, the development of products from turtle dives, or the observation of turtles laying eggs. 43At the moment none of these actions have been implemented, although individual initiatives have been employed. We can see that the dive clubs and boat companies with glass bottoms are using turtles to advertise their activities. 44Other tourist activities are developing around turtles and in Martinique the observation of marine turtles is mostly an under-water activity. 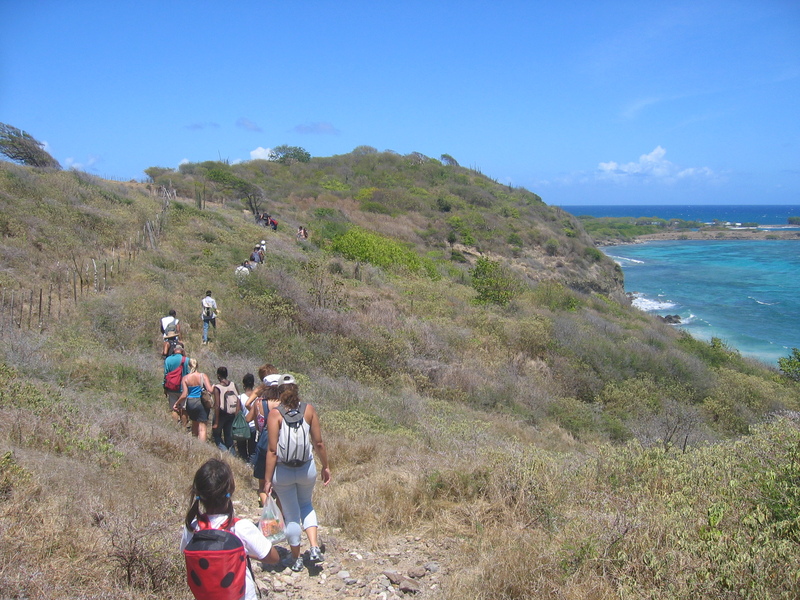 45The decision to adopt ecotourism in Martinique is as a result of several factors. Ecotourism facilitates the geographical diffusion of tourism, relieving overcapacity along the southern coast. Terrestrial ecotourism may also attract more tourists inland. Thus, it result in a more equitable distribution of tourist sites. 46Marine ecotourism can also contribute to a better distribution of tourists. Martinique is estimated to receive 160 000 divers per year. This pressure is currently dispersed unequally with 70% of annual diving concentrated in one quarter of the diving sites at the same time as more than one in three sites have an average of only one dive daily at most. Seven sites have exceeded the « threshold of ecological acceptability», proposed by Hawkins and Roberts in 1997 for the reefs of the Netherland Islands (which range from 5 to 6 000 dives per year). 47Ecotourism is also economically attractive: This type of tourism requires infrastructures that need less capital than "classic" tourism activities. 48Another advantage for Martinique is the involvement of local populations in tourism with ecotourism products being developed and implemented by residents. The current tourism resorts in Martinique, give local people little or no opportunity for involvement in decision regarding tourism. Alternatively, local communities involved in ecotourism participate in protecting and enhancing natural environment, the main resources for their business. 49The final advantage of ecotourism is the protection of natural resources. To maintain the quality of these natural areas, it is essential to implement tools to protect and manage these spaces. Martinique has a large number of tools protecting the natural areas, but very few are implemented and present protections are unequally covered by various protections (although it remains to be improved), but marine areas are somewhat neglected. The development of marine ecotourism activities will help develop tools for the protection and the management of these areas. 50Since the end of the 1990s, tourism has undergone a noticeable recession in the French West Indies, where there has been a net loss in clients and the dilapidation of structures in a context of strong regional competition. Paradoxically, the local populations does not seem to be aware of the issues facing the future of the islands. 51Beyond the standard considerations involved in implementing tourism programs and marketing strategies, the crisis in the French West Indies challenges the extent of desire for tourism and more generally, the acceptance of the fact that the ‘other’ is there. The positioning of local societies with regard to the role and benefits of tourism remains ambivalent and yet, on an economic level and in the current context, the sector could fully contribute to a comprehensive development strategy for the French West Indies. A revival in tourism consumption could quickly restore two thousand jobs that are no longer in the sector, and additionally bring about a modest gain of a thousand jobs. 52The islands must reconsider their position within the regional market. If the decline in mass coastal resort tourism is unavoidable, retaking a significant number of clients remains vital in order to profit from transport services and tourism logistics. Other possibilities have been contemplated, such as the upscale tourism market structured around a number of luxury amenities, encouraged by adequate security levels throughout the territory (a particular advantage, given the unpredictability of competing destinations in the Caribbean region). There is a large consensus on ecotourism, but the way forward remains unclear. The choice of future developments corresponds to protective measures that appear to use ecotourism as a premise for denying access to site and excluding local people. 53For destinations like Martinique that have base their tourism on the traditional resources of tropical beaches, ecotourism has become unavoidable. Such destination need to differentiate their tourism industry in an increasingly competitive global market, where the stereotypes of tropical tourism have been widespread and environment commitments are mostly superficial. Ecotourism is a simple yet effective strategy to diversifying the tourism industry. Augier, D. (2005). L’écotourisme à la Martinique, mémoire de Master, Université Antilles-Guyane, Faculté de Droit et d’Economie. Augier, D. (2007). « L’écotourisme forestier : pour un rapprochement entre tourisme et environnement à la Martinique », Études caribéennes, 6/2007, L'écotourisme dans la Caraïbe. URL, <http://etudescaribeennes.revues.org/document440.html>, consulté le 05 juillet 2009. Cazes, G. (1968). « Le développement du tourisme à la Martinique », Les Cahiers d’Outre -Mer, t.21, n°83 : 225-256. Couture, M. (2002). « L’écotourisme, un concept en constante évolution », Téoros, 21(3) : 5-13. Dehoorne, O. (2007). « Les déboires du tourisme à la Martinique », Travaux et documents, n°32 : 85-106. Dehoorne, O., P. Saffache et D. Augier (2007). « Tourisme et écotourisme dans la Caraïbe. Eléments de réflexion sur les stratégies de développement », Etudes Caribéennes, 6 : 27-47. Direction régionale de l’Environnement (2009). Profil environnemental de la Martinique, DRE : 3-54. Duval, T-DT D. (2004). “Trends and circumstances in Caribbean tourism”, In T. D. Duval Ed. Tourism in the Caribbean. Trends, Development, Prospects, Routledge : 3-22. Institut d’Emission des Dépard Outre-Mer.NSTITUT (2006). Le tourisme dans les Dom-Tom, Paris, IEDOM-IEOM. Lequin, M. (2002): “L’écotourisme. Expérience d’une interaction nature-culture”, Téoros, 21(3) : 38-42. Lequin, M. (2001). Ecotourisme et gouvernance participative, Presses de l’Université du Québec. Observatoire du milieu marin martiniquais (Mars 2006). Esquisse cartographique au 1/100 000e des biocénoses benthiques de la Martinique, OMMM. Office national de la chasse et de la faune sauvage (Janvier 2006). Plan de restauration des tortues marines des Antilles Françaises, ONCFS. Sheller, M. (2003). Consuming the Caribbean: From Arawaks to Zombies, London and New York, Routledge. World Tourism Organisation (2003). Sustainable development of Ecotourism. A Compilation of Good Practices in SMEs, Madrid, WTO. World Travel and Tourism Council (2001). World Travel and Tourism Council, Year 2001. Tourism Satellite Accounting Research (Caribbean), London, World Travel and Tourism Council. 2 “The study of tourism in the French West Indies immediately comes up against an astonishing ambiguity; the neighbouring islands, so similar in nature, drink incessantly from this source of wealth and yet the current seems to deliberately avoid Martinique and Guadeloupe despite their best efforts to redirect it their way” (Cazes 1968). 3 The arrival of the Boeing 747, the Minerve flights from Brussels, then Paris, next the drop in price after competition from such companies as Air OutreMer, Corse Air and Air Liberté. 6 The eastern side, exposed to the wind, experiences a rainfall level 1,000 mm higher than that of the west side. The summit of Montagne Pelée records over five metres of rain per annum.